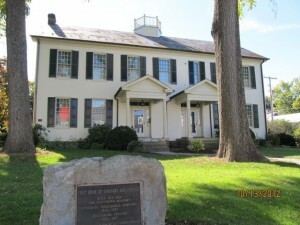 The Tillie Pierce House as it appears today. 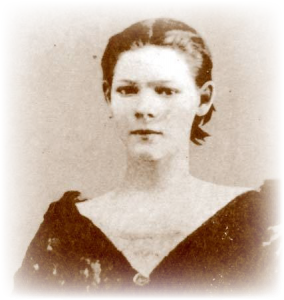 Matilda (Tillie) Jane Pierce was born at the house on the corner of Baltimore and Breckenridge Streets in Gettysburg on March 11, 1848. She was the youngest of four children. Her two older brothers, James Shaw and William H., grew up learning their father’s trade as a butcher. Mr. Pierce was one of the wealthiest men in town due to his business. It was proper and good (and typical of that time) for the boys to grow up knowing they would take over their father’s work some day. Tillie and her older sister Margaret learned from their mother, also named Margaret. They became experts at cooking, sewing, cleaning, canning and drying foods, and entertaining. Tillie and her sister also attended school. As teenagers, they went to the Young Ladies’ Seminary at the Gettysburg Female Institute to learn languages, literature, needlecrafts, and etiquette. 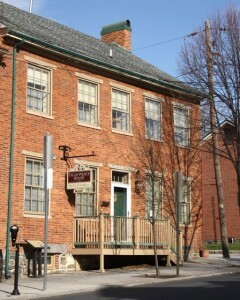 This is a photo of the building today. 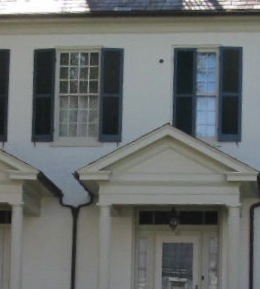 If you look closely, you can see a piece of artillery stuck in the brick beside a window on the second story. Below you can see a close-up of that part of the building. Note the artillery round stuck in the bricks beside the upper window, evidence of the dangers of being in Gettysburg when the fighting broke out. Tillie was at this school when the real trouble began at Gettysburg. She and her classmates were told to hurry home. 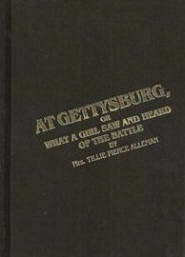 I won’t go into much detail here, because the book recounts the story of Tillie’s days surrounding the Battle of Gettysburg. Thankfully, she survived the ordeal and went on to live a productive life. A few years after the war was over, Tillie met a young man who was a student at the Lutheran Theological Seminary. Horace Alleman studied to become a lawyer, and upon graduation, he and Tillie were married on September 28, 1871. They moved to Selinsgrove, Pennsylvania, near Philadelphia, where they raised a family and lived well in one of the town’s most treasured homes: the Governor Simon Snyder Mansion. They had three children. Because so many people wanted her to record her story of the events she experienced in Gettysburg, Tillie gave in and wrote her account in 1885. 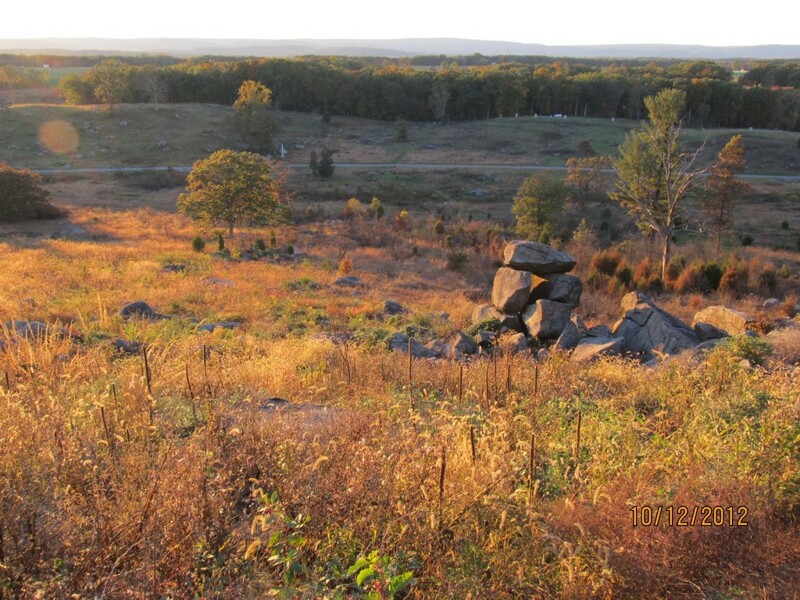 She entitled it AT GETTYSBURG, OR WHAT A GIRL SAW AND HEARD OF THE BATTLE. This hardcover edition is available online at The Shriver House Museum. Click on the cover to go to their website. You can also see other books on the Shriver House Museum site, including one about the Shrivers, written by museum owner, Nancie Gudmestad. Tillie Pierce Alleman died on March 15, 1914, in a hospital Philadelphia, PA. Both she and her husband are buried in the Trinity Lutheran Cemetery in Selinsgrove, PA. This link will take you to her gravesite online. Tillie Pierce Alleman has a Facebook page, too! Click on the icon to “like” it!